Coconut Custard with Popcorn — always with butter. First make the coconut custard. Add the coconut rum to a pan, place on a medium heat and reduce by half. Once reduced, set aside to cool. Add the cream, vanilla and coconut milk to a pan and bring to the boil. Meanwhile, whisk together the yolks and sugar until pale and smooth. Measure out 50ml of the hot coconut cream mixture into a small bowl. Sprinkle the gelatin over and let sit for a few minutes to bloom. Set aside. Whisk the remaining coconut cream into the egg and sugar mix until smooth. Return this mixture to the pan and place over a low heat, cooking and stirring until thick enough to coat the back of a spoon. Take off heat and stir the gelatin coconut cream into the custard. Mix in the reduced rum and pass through a sieve into a clean bowl, then set aside to cool. To make the popcorn, place a pan (with a lid) over a medium heat and add the oil. When the oil is hot, add the popcorn kernels and replace the lid. Keep shaking the pan over the heat until there is no more popping. Spread the cooked popcorn out onto a tray, discarding any un-popped kernels. Melt the chocolate in a double boiler, stirring until nice and smooth, then stir in the almonds. Stir the popcorn into the chocolate until nicely coated, then spread out onto a lined tray and place in the fridge for 10 - 15 minutes to set. One set and hard, break the popcorn sheet into bite-size pieces. To assemble the dish, add the custard to a piping bag and pipe into the bottom of serving glasses. 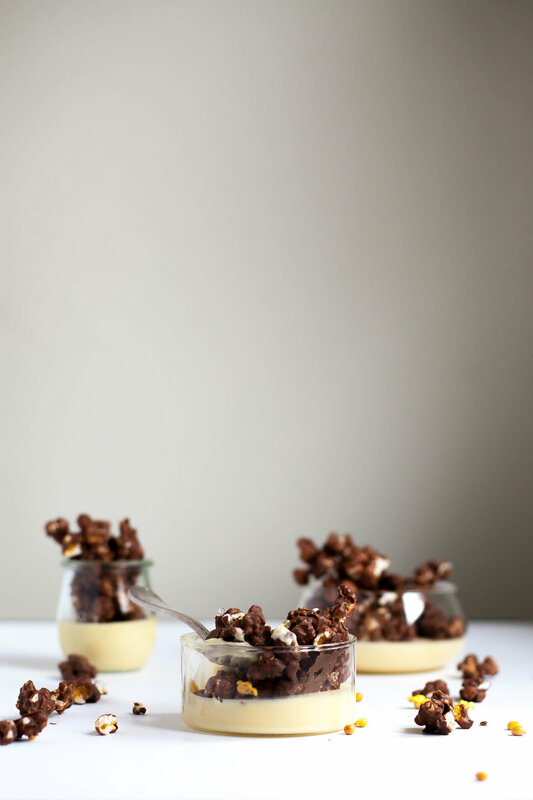 Top with the chocolate popcorn and serve. I'm not generally one for custard or pudding. Not a fan of that smooth texture, I like something you can bite into. So this one is perfect for me. The crunchy topping that you get in every bite adds just what i need. And it's a coconut custard, I have a weakness for all things coconut. I found this recipe on a british site so hence the milliliter measurements, I tried to convert it to the standard cups but it works out to things such as .442 of a cup. Yeah thats not really helpful... So milliliter it is!